Beautiful certificate from the Horton Aircraft Corporation issued in 1953. This historic document was printed by Chipron Company and has an ornate border around it with a vignette of an eagle. This item has the signatures of the Company's President, William E. Horton and Secretary, Armand J. Hanson and is over 55 years old. 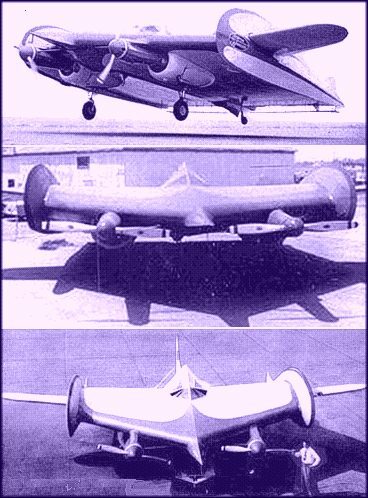 Not truly wingless, but essentially a highly-modified Cessna UC-78 with a more airfoil-shaped fuselage than wing. Although this innovative protoype flew successfully, no backers were attracted, and the project was abandoned, with the plane eventually being deliberately burned. Horton Aircraft Corporation. -- This registrant, a Nevada corporation, was organized for the purpose of manufacturing and selling a so-called Horton Wingless Airplane. The company filed two registration statements with the Commission. The first statement, filed in 1955, covered a proposed offering of 500,000 shares of no par value common stock of which 400,000 shares were to be offered by the registrant and 100,000 shares by the president, William E. Horton, at $1.00 per share or the market price, whichever was higher. The other registration statement, filed in 1956, covered 100,000 shares of common stock ofthe registrant held by Horton which was to be offered at $25.00 per share. A consolidated hearing was held as to both registration statements and the Commission issued a stop order suspending the effectiveness of both statements. The Commission found the registration statements false and misleading in the following material respects, among others. The representation, in the registration statements that Horton had assigned to the registrant a patent with respect to the wingless airplane was materially misleading in view of the fact that Horton had previously assigned all of his right,title and interest in his "invention" to another person. The description in theregistration statements of the Horton Wingless Airplane, the aeronautical principles involved, and the coverage of the patent obtained by Horton, was also materially false and misleading. False and misleading statements were also made with respect to the performance of Horton's model of the wingless plane. The registration statements also contained false and misleading statements with respect to the use of the proceeds from the previous sale of unregistered securities, the price of the securities being registered and the proposed use of the proceeds therefrom. In addition, the Commission found that while the second registration statement disclosed the entry of an injunction against registrant and Horton based on false and misleading claims and the return of an indictment against Horton based on fraud, registrant nevertheless omitted to disclose the nature of the false and misleading statements and the fraud involved.